The conventional wisdom among most historians is that the Confederacy didn't have much of a navy. So most of them, William N. Still excepted, haven't written much about it. But Maurice Melton has looked harder and, where others found mostly dross, he found "the best station of them all." Many years in the making, this meticulously researched and stoutly written account details, for the first time, the rise and fall of the South's first brown water fleet. Melton's story takes place along the Atlantic Coast between Cape Fear, NC and Savannah GA. It was a defender's nightmare; a porous maze of barrier islands, marshes, rivers, and creeks. He describes the region's unique topography like an expert pilot reading a nautical chart. When Georgia seceded, Savannah native and aged naval hero Josiah Tattnall had the task of trying to defend this area with a ramshackle flotilla of a few coastal steamers and tugs that became known as "The Mosquito Fleet" because of the swarms of pesky insects that bedeviled the ships' crews. In the war's first months, Melton maintains, Tattnall's coastal guardians "plied the river from the city docks to Tybee and Cockspur Islands and occasionally ran to Port Royal and Charleston." They rarely saw an enemy vessel. This changed dramatically when Tattnall's band of makeshift mariners encountered the largest armada ever assembled by the United States off Port Royal Sound in November 1861. Melton describes the Union's first naval victory by carefully balancing the tactical strategies of the combatants with compelling anecdotes about some of the conflict's lesser known personalities. The result clearly illustrates why combined army/navy operations for both sides proved difficult at best, disastrous at worst, throughout the war. Nevertheless, all the barrier islands between Port Royal and Savannah were soon under Union control. Major General Robert E. Lee arrived in Georgia for his first field assignment on the day Port Royal fell. He quickly ascertained that "there were not enough men and guns to defend all the South Atlantic coast." His recommendation, according to Melton, "was to abandon most of the coast, leave the barrier islands and the smaller port cities to the enemy, and concentrate forces to save Charleston and Savannah." Lee left for Virginia in March 1862 but the Yankees were on the coast to stay. Melton also describes the symbiotic and often contentious relationship between naval affairs and blockade running and the critical role played by African American pilots, both slave and free, in guiding ships over sandbars and along swampy river banks. 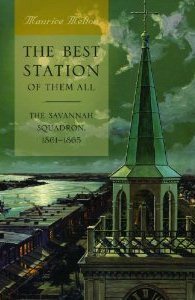 He has mined the voluminous records of the Savannah River Squadron along with personal letters, diaries, and newspaper accounts to chart the history of the unit and its relationship to the people of wartime Savannah. After General William T. Sherman captured their home port and Wilmington, the Confederacy's last operating seaport, fell to a Union land/sea operation in January 1865, the sailors of the Savannah River Squadron became soldiers. They joined the Army of Northern Virginia and fought as infantry until they were captured at Sailor's Creek on April 6, 1865, an ironical end for a hardy band of mariners.